In the United Safer States of America, personal safety has become society’s obsession. French fries are illegal, contact sports have been banned, and obesity is a crime punishable by imprisonment. Teenager Bo Marsten has grown up in this ultra-safe environment, but he has trouble following the many rules. Rash is the story of how his “rash” behavior lands him in a prison camp run by a sadistic former football coach, where he must play an illegal and almost forgotten sport: tackle football. Pete Hautman grew up in St. Louis Park, Minnesota, attended both the Minneapolis College of Art and Design and the University of Minnesota, and worked as a sign painter and graphic artist before turning to writing. In 1991, he completed the novel Drawing Dead which was published by Simon & Schuster two years later. Since then he has authored such critically-acclaimed and award-winning titles as Mrs. Million, Sweetblood and Doohickey. He won the 2004 National Book Award for Godless. When he is not writing, Pete likes to read, play poker, run, hike and cook. He lives in Minnesota and Wisconsin with mystery writer and poet Mary Logue and their two poodles, Rene and Jacques. 1. In the first chapter we learn that Bo’s father, as well as several other family members, are serving time in prison. How does that influence Bo’s decisions? 3. Bo’s grandfather was born in 1990. How does that affect his world view compared to that of his grandson? 4. In the 1960s, no one other than professional bike racers wore bicycle helmets. Did people back then value life less? Were they stupid and ignorant, or are bicycle helmets a bad idea? 5. Since 1931, more than 1000 people have been killed while playing football. Every year, football injuries send more than 200,000 children and teens to emergency rooms. Should football be banned? 6. Is it possible for personal safety and personal freedom to coexist? When is it desirable to take away personal freedoms in order to make people safer? 7. Which of your freedoms have been taken away to make you safer? 8. Are Americans are safer today than they were fifty years ago? Why? 9. Most people would agree that murderers should be locked up. But what about drug users? What about the mentally ill? What about people with different political or religious views? How do we decide who should be in jail? 10. Studies have shown that the ability of young children to control their impulses is a reliable predictor of future success. But many kids and teens (and adults!) have poor impulse control. Are they doomed to fail, or can impulsive behavior be constructive? Many sci-fi novels are set in the near future. Two other examples are Feed by M.T. Anderson, andThe Hunger Games by Suzanne Collins. How do the futures imagined in those books compare to the future imagined in Rash? In the year 1960, there were no seatbelts in cars, no one wore bicycle helmets, most adults smoked cigarettes, and a lot of boys carried jackknives to school. Today, those things are no longer the case. Rash imagines one way our society might look in another fifty years. Try to imagine a different scenario—create your own future world. In Rash, the artificial intelligence Bork becomes self-aware and develops a sort of free will. Many scientists believe that Artificial Intelligence is possible and perhaps inevitable, but is it something you will see in your lifetime? Is it possible for a machine to develop a sense of humor? How close to developing AI are we today? Research the current state of artificial intelligence: What is the smartest machine ever built? How does it compare to the computing machines of the 1950s? If the best chess player on earth is a computer, does that make machines “smarter” than people? Today, the United States of America has only 5% of the world’s population, but we have 25% of the worlds prisoners—more than ever before in the history of our country. Why is that? Do we have more bad people? Are people getting worse? Or are there just more laws for people to break? Check the statistics from the Department of Justice website to see whether murder and violent crimes have increased or decreased. Are people more afraid than they used to be? Interview your parents and other adults. Do they feel safer now than they did ten years ago? Twenty years ago? What are they afraid of? Many “sports” that people once engaged in have been banned or are simply no longer practiced because they are considered too cruel or dangerous. Examples include pistol and sword duels, jousting, gladiator battles, and dog fighting. What are the ten most dangerous sports practiced today? Make a list, beginning with the most dangerous. How many of those sports will still be popular 100 years from now? What do smoke-free restaurants, seatbelts and airbags in cars, and bicycle helmets have in common? Fifty years ago none of those things existed. People smoked cigarettes everywhere—even in hospitals. Cars had no seatbelts or airbags. And any kid dorky enough to wear a helmet while riding a bicycle would have been laughed off the street. I wonder. Being safe is good—to a point—but I sometimes think we are so obsessed with safety we miss out on much of what life has to offer. I mean, if you wanted to be really safe, you would eat nothing but oatmeal, kale and lentils. You would never play contact sports, or ride a skateboard, or go for a hike in the mountains, or speak to a stranger, or drive a car, or give birth to a child...or do much of anything at all. What if this safety trend continues? What will it be like in another fifty years? How safe do we want to be? Will sneezing in public be considered assault? Will tricycles have airbags? Will overweight people be sent to forced-labor diet farms? Will kitchen knives bear warning labels? (Caution: This implement can cause cuts!) Will French fries be as illegal as crack cocaine? 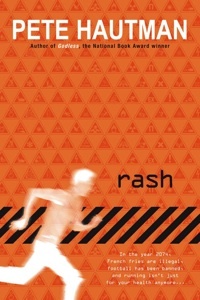 Thinking about these things was what led me to write Rash , a sometimes funny, sometimes not funny book about a teen growing up in the "United Safer States of America," circa 2074, when pedestrians wear walking helmets, football has been banned, verbal abuse is a misdemeanor, and obesity is a felony. And because just about everything is illegal, nearly 20% of the population is in jail, where they provide the manual labor that keeps the USSA running. Bo Marsten, like his imprisoned father and brother, has trouble following the rules. Rash is his story.